You are browsing the archive for But is it art. 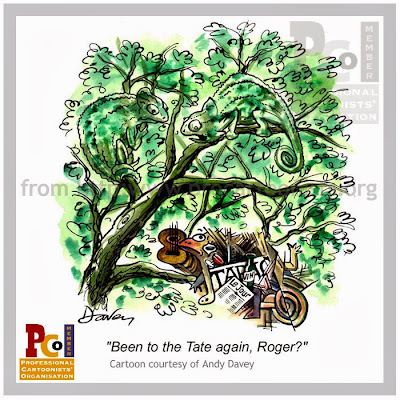 Shrewsbury International Cartoon Festival – But is it Art? PCOer Alex Hughes submitted this caricature of Prime Minister Gordon Brown for the “But is it Art?” show at this year’s Shrewsbury festival. Click the picture to enlarge it. 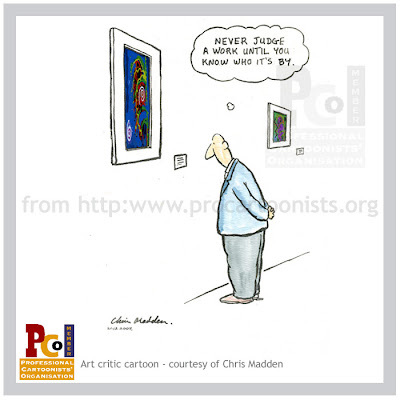 One of PCOer Mike Turner‘s contributions to the “But is it Art?” show running at the Shrewsbury Festival. 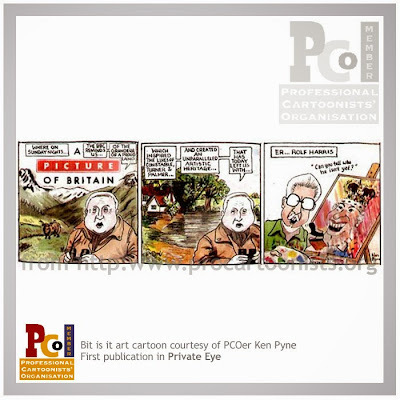 A contribution for the “But is it Art?” show from PCOer Ken Pyne. The show is currently being exhibited in Shrewsbury until the end of April. Click to enlarge the picture. Bloghorn is going to be taking a break from our regular Friday feature during April as we feel we may have a lot on our plate with the upcoming cartoon festival. PCOer Martin Honeysett has submitted this piece for the But is it art show up in Shrewsbury. 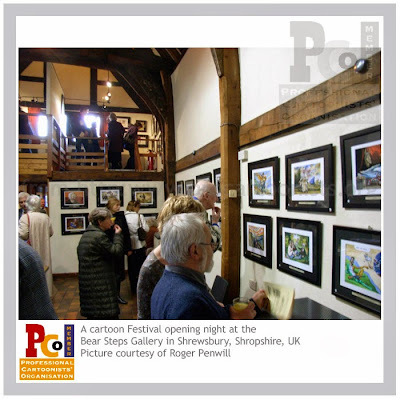 Six exhibitions of high-quality cartoon and comic art opened at the Shrewsbury festival yesterday evening. All free to enter and available to all, are the But is it Art? cartoon show and a one man show for Dave Brown of The Independent. 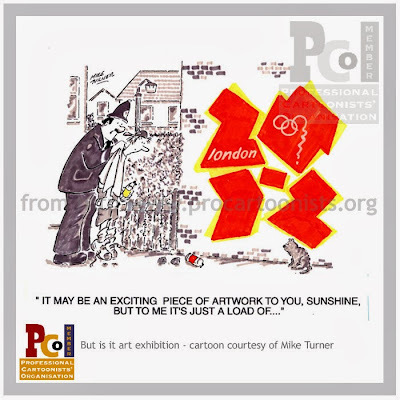 The national UK Cartoon Museum has lent a collection for display and there is also a caricature show and contributions from cartoonists and artists from both Belgium and America. As is only appropriate, the Shropshire Star newspaper today begins the countdown to the Shrewsbury Cartoon Festival. The event takes place on the weekend of April 18-20, but the main festival exhibition, entitled “But is it Art?”, opens this Sunday (March 30) and runs until April 26. Click on “But is it art”, under Labels below, to see examples of many PCO members contributions to the show. 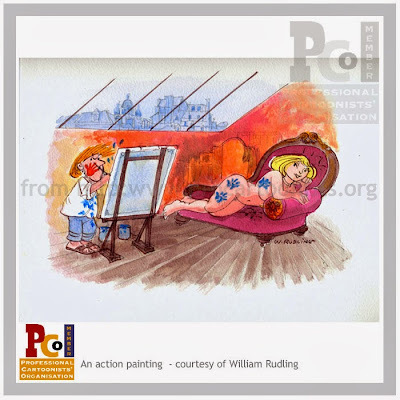 Below is one from PCOer William Rudling. Another sneak preview of submitted work for the “But is it Art?” show at the forthcoming Shrewsbury International Cartoon Festival. This cartoon is by Chris Madden. Bloghorn says click M for Madden. A sneak preview of submitted work for the “But is it Art?” show at the forthcoming Shrewsbury International cartoon festival. This cartoon is by Andy Davey. Bloghorn says click D for Davey. 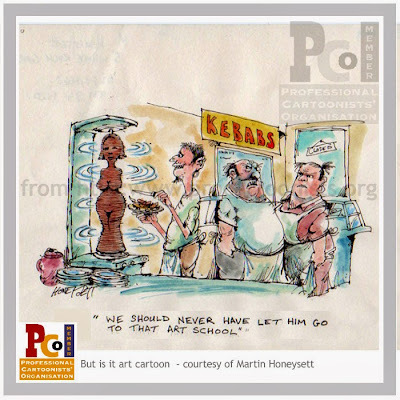 “But is it Art?” by PCOer Nathan Ariss – another contribution to Bloghorn’s sneak preview of a major exhibition which opens in less than a month’s time and is part of this year’s Shrewsbury Cartoon Festival. In other news, PCOer Clive Collins, a previous cartoonist of the month here, alerts us to a one-off event at the Barbican centre in central London where former Punch cartoonist and Oscar winner Bruce Petty is showing his film called Global Haywire. Clive describes Australian Bruce’s work as in the “zany, big explosive cartoons vein”. Sounds good to us. You can find out more about Petty’s film here.